Thanks to social networks these days, we are beginning to see some very interesting crews on board The Yacht Week. The Crew Finder has managed to combine adventurous individuals from all over the world, looking to join a crew of people they did not know from before. They may come from different countries, cultures, traditions, and backgrounds but all share one thing in common: they will do anything to make The Yacht Week dream become a reality. Week 32 brought forth a myriad of crews spontaneously formed via the Crew Finder. We have ourselves here in Croatia one of the most international crews. Let’s get to know them and see how they magically came together. In the land down under, after two years of planning, two Australian girls, Lucy and Colby, finally decided to put their best foot forward to organize a boat. In the next town over, Madeline had booked a boat all on her own composed of her best friends from university. Both Lucy and Colby and Madeline booked their two boats without having any definitive commitments from any of their friends. From that point on, the only option was to be open to what life would throw at them in the next few months until departure. Two months into the planning process, Madeline’s friends all dropped out, leaving her to be completely dependent on The Yacht Week Forum. At this point, it was not desperation, but rather hope and curiosity that raced through Madeline’s mind to find her dream team for the summer. Once her annoucement was sent out on the forum, Colby and Lucy immediately responded to their fellow Aussie to start forming their crew for Week 32. After the three Aussie girls joined forces, Kelly from Canada also decided to hop on board. At this point, the booking was closed and a crew of four committed girls were finally together and ready to set sail. Little did these girls know that upon arrival to Croatia, they’d be receiving one more free spirited individual on board. On check-in day in Kastela Marina, a forlorn Sahil Wahid from Bangalore, India came with the bad news that the booker of his boat mysteriously decided to cancel the booking two days prior to The Yacht Week experience. Sahil had everything paid for and all plans organized pre and post Yacht Week. Not even being alone in a foreign country would stop him from living the dream. The bubbly positive Indian from Bangalore told me himself that “I always look for the open door in situations. My positive attitude tends to be my sherpa on my travels.” Although Sahil had been immediately notified on the spot by The Yacht Week that no booking of his boat was ever made, he was given the option to sit tight and wait for an opportunity to arise. On the opening party of Week 32 in Trogir, Sahil arrived with an open mind and a willing energy to find his crew. If Plan A didn’t work, he was promised a spot on The Yacht Week crew boat. 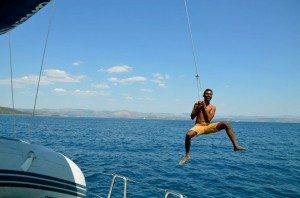 After numerous tries and friendly interactions with people, Sahil still didn’t get a confirmation from anyone and decided to at least enjoy possibly his first and last night in Croatia without having lived The Yacht Week experience. After a couple mojitos, Sahil was about ready to call it a night until a group of 4 energetic Australian and Canadian girls ran up to him telling him they’d love him to join them on board as the only boy for the most epic Week 32 of Yacht Week history. Is it a “connect the dots” type of story, is it destiny, fate, or simply just the positive attitude some people have in life that brought together three Australian girls, 1 Canadian girl, and 1 Indian boy all together to enjoy one of the best weeks of their life. Interview with Sahil Wahid Age: 24 Hometown: Bangalore, India What is your real job: I own a travel company. The Yacht Week in a nutshell: Letting everything go and just making it happen. If you could work for TYW what would you want to do: I would love to make The Yacht Week popular in India. When you’re not working, what are you doing: Working for a high end travel company. I travel for work, so every work assignment is a trip in itself. Something not everyone knows about you: I used to be a car racer, but I gave it up two years ago and I am now part of an exclusive driving club. Every Sunday I get together with a group of passionate drivers to test high-end cars.